Scientists from UCLA’s California NanoSystems Institute have developed a Google Glass app that, when paired with a handheld device, enables the wearer to quickly analyze the health of a plant without damaging it. The app analyzes the concentration of chlorophyll, the substance in plants responsible for converting sunlight into energy. Reduced chlorophyll production in plants can indicate degradation of water, soil or air quality. One current method for measuring chlorophyll concentration requires removing some of the plant’s leaves, dissolving them in a chemical solvent, and then performing the chemical analysis. With the new system, leaves are examined and then left functional and intact. The research, led by Dr. Aydogan Ozcan, Associate Director of the UCLA California NanoSystems Institute and Chancellor’s Professor of Electrical Engineering and Bioengineering at the UCLA Henry Samueli School of Engineering and Applied Science, was published online by the Royal Society of Chemistry journal Lab on a Chip. 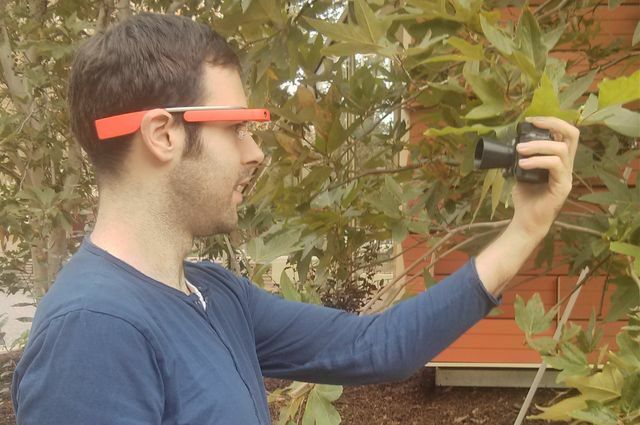 The system developed by Dr. Ozcan’s lab uses an image captured by the Google Glass camera to measure the chlorophyll’s light absorption in the green part of the optical spectrum. The main body of the handheld illuminator unit can be produced using 3-D printing and it runs on three AAA batteries; with a small circuit board added, it can be assembled for less than $30. Held behind the leaf, facing the Glass wearer, the illuminator emits light that enhances the leaf’s transmission image contrast, indoors or out, regardless of environmental lighting conditions. Tiny and transparent, the marine crustacean Paraphronima gracilis sees the world through two large eyes that envelop its head like a high-tech space helmet. Now, a new study of this amphipod—a close relative of the sand hopper—reveals that it has 32 different retinas, the light-sensitive parts of its eyes. “We have never seen the retina split up this way in any other arthropod eye, not in insects, not in crustaceans, or other animals with a compound eye,” explains Jamie Baldwin Fergus (http://invertebrates.si.edu/baldwin-fergus.htm), Ph.D., Peter Buck Postdoctoral Fellow at the Smithsonian’s National Museum of Natural History, and lead author of a detailed study of this eye published online on January 15, 2015 in Current Biology. “This eye design has not been described previously and its function is unknown,” said Dr. Fergus. In addition to Dr. Fergus, Karen Osborn (http://invertebrates.si.edu/staff/osborn.cfm), Ph.D., of the Smithsonian’s National Museum of Natural History, and Sonke Johnsen (http://sites.biology.duke.edu/johnsenlab/), Ph.D., of Duke University are also co-authors of the Current Biology paper. Living at depths of 150 to 500 meters off the coast of California, P. gracilis inhabits an environment that is totally dark to the human eye. As it swims, its eyes are positioned upward, looking for prey, transparent creatures called siphonophores, swimming above. In most compound eyes, the retina is a single continuous pigmented sheet. The 32 retinas in the eyes of P. gracilis appear as a series of tiny orange upside-down pyramids neatly arranged in two rows on either side of the animal’s head. Light travels to each retina through a row of transparent facets called ommatidia that cover the eye, collecting light that is channeled through guide tissue similar to fiber optic cables. Many of you might well be interested in a story posted on January 30, 2015 in Smithsonian Science. The story posed and answered the question of how tiny little birds manage to survive and stay warm during bitterly cold winter weather. The article was entitled, “Keeping Warm in Winter is for the Birds.” It was authored by John Gibbons, the Press Secretary for Science at the Smithsonian Institution. Gibbons is also the media contact for the Smithsonian’s Museum Conservation Institute (MCI) (http://www.si.edu/mci/). His story on birds coping with winter appeared, specifically, in Smithsonian Science’s Research News/Conservation Biology section. The entire story, along with some gorgeous images of different birds dealing with cold weather can be viewed at http://smithsonianscience.org/2015/01/keeping-warm-winter-birds/. The Smithsonian Science site (http://smithsonianscience.org/) offers a continuously updated source of fascinating stories on a wide range science and biology topics. According to Smithsonian Science, John Gibbons has over ten years of experience in publicizing research and science. From giant panda babies to 3D scanning of museum collections, Gibbons has shared Smithsonian discoveries with the world. He is most happy when his passions for ornithology and journalism combine, making him the go-to man for the latest in Smithsonian bird research. Much of the most current Gibbons bird story is provided below. “You watch the weather forecast, gear up with hat, coat, scarf and gloves, but you still get cold after just a short time in the snow and wind. If it’s such a challenge for humans to stay warm outside, how do birds―especially the little delicate guys like chickadees and titmice―survive the single-digit temperatures and whipping winds of winter? A better understanding of the way metabolism works may, in the long run, make it easier to find new medicines for diseases such as diabetes. By combining different methods taken from physics, the freshly-minted Ph.D. researcher Anna-Karin Gustavsson, of the University of Gothenberg, Sweden, has been able to study metabolism in individual cells. The objective of these research studies is to see what cells do when there are changes in their environment. In her work, Dr. Gustavsson has created a specially designed microfluidic chip containing channels through which different solutions are able to flow. With the aid of optical tweezers, a highly focused laser beam, she captures individual cells for placing at the point where the channels intersect. This intersection between the channels is where the cells' immediate environment can change very rapidly. “By using a microscope, I have been able to monitor what the cells do when there are changes in their environment. I discovered that the concentration of molecules in the metabolism of individual cells while these [cells] are breaking down sugars could, under specific conditions, be made to rock; i.e., oscillate.” Up to this moment, it had never been possible to achieve the monitoring of oscillations in individual cells, despite there being many publications describing attempts to do this in high-ranking journals. “The ability to confirm that this [does indeed] take place in individual, isolated cells is something new,” says Dr. Gustavsson, who, together with her colleagues has also produced a mathematical model for the behavior of the cells during glycolysis, the process whereby sugars are broken down in our cells to create energy. In both human cells and yeast cells, which are the focus of Dr.
After undergoing surgery to remove diseased sections of the colon, up to 30 percent of patients experience leakage from their sutures, which can cause life-threatening complications. Many efforts are under way to create new tissue glues that can help seal surgical incisions and prevent such complications. Now, a new study from MIT reveals that the effectiveness of such glues hinges on the state of the tissue in which they are being used. The MIT researchers found that a sealant they had previously developed worked much differently in cancerous colon tissue than in colon tissue inflamed with colitis. The finding suggests that for this sealant, or any other kind of biomaterial designed to work inside the human body, scientists must take into account the environment in which the material will be used, instead of using a “one-size-fits-all” approach, according to the researchers. “This paper shows why that mentality is risky,” says Dr. Natalie Artzi, a Research Scientist at MIT’s Institute for Medical Science and Engineering (IMES) and senior author of a paper describing the findings that was published in the January 28, 2015 issue of Science Translational Medicine. The title of this paper is “Regulation of Dendrimer/Dextran Material Performance by Altered Tissue Microenvironment in Inflammation and Neoplasia.” Dr. Artzi is also a Professor at Harvard Medical School and a Researcher at the Harvard-MIT Division for Health Sciences and Technology. In addition, she is Assistant Professor, Department of Anesthesiology, Brigham and Women's Hospital, Harvard Medical School. “We present a new paradigm by which to design and examine materials.